This medal is in strict agreement with the revelations received by Marie-Julie Jahenny in the course of several ecstasies and recalls the special devotion that this pious stigmatist devoted to the veneration of the Cross and to the Very Holy Virgin whom she implored so often at the foot of the ancient statue of Our Lady of Good Counsel. In 1268, the Count and Countess of Blois made a vow to establish a monastery of Clarisses in Coulanges, near Blois. The following year, on a pile of stones and thorns, a flame of fire appeared to shepherds who kept their flocks at the site called La Guiche (Small Strap). The appearance would last several days. To get warm, they would run toward this flame, but having arrived at the spot of the apparition of the fire, they found neither warmth nor brightness. The Count and the Countess, having been informed, thought that God was manifesting to them thus the site where they were obliged to build the promised monastery. Removing from the site a pile of stones, brambles and thorns, they found an arch of stone which, when exposed, caused them to discover a statue of Our Lady, the origin of which they were ignorant. The Count took custody of the statue and while awaiting the completion of the monastery kept it with dignity and devotion. The main altar of the monastery was constructed at the site where the statue was found. The monastery was completed and instituted on August 5, 1273, on the feast of Our Lady of the Snows, and the miraculous statue was solemnly erected and placed on the main altar. There the statue remained for over 500 years. 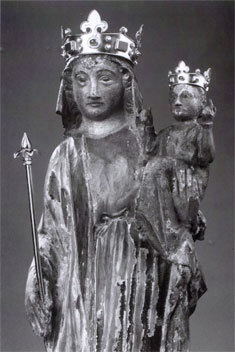 At the time of the French Revolution, by a providential intervention, this precious statue left the Monastery of La Guiche and was successively kept in the homes of many families in the region of Tours until 1878. It is at that time that a pious person who had custody of it had the clear perception that God was asking her to sever herself from it and to have it sent to La Fraudais, to Marie-Julie Jahenny, who would know better to pray to Our Lady. "My child, this is My history. "One day he asked his master for the heart of a tree and the master fulfilled his wish. He carved the piece of wood each day as he advanced in his work. I helped him and he finished the Statue. He lodged me in his poor habitation where he slept. After his death the Statue stayed a long time in the family of his masters. "In the early days, I had my little oratory, poor but rich in visits, Christian mothers came to consecrate their little children to me, many priests kissed My Statue. I averted very often the dangers and perils that were coming upon my children. "The Blessed Mother added that after many years, the time in which She would emerge would arrive. It is then that Her Divine Son would throw from Heaven, on the site where the Statue was buried, a luminous torch that would attract attention. The sealed up stone was opened with respect and we maintained a great veneration for this site. 'I was intact,' said the Blessed Mother. "On this land prayers were recited immediately and I manifested My glory in giving health to a little child. "My name is OUR LADY OF GOOD COUNSEL." The text was asked by the Most Blessed Mother herself, following the arrival of Her Statue to Marie-Julie in November 1878. "O You, Blessed Mother, who has crushed the head of the serpent, keep our faith and the innocence of our little children." "It is not necessary that this medal be of a great price, its value will be the same. This will be to keep the innocence in a time so difficult, when the pestilence of corruption will be effused everywhere. All Christians will be able to provide themselves with this medal as a defense and as a weapon of Faith that will conquer sinful living and the treachery of evil." "I hail you, I adore you, I embrace you, oh adorable Cross of My Savior. Protect us, keep us, save us. Jesus loved you so much, by His example, I love you. By your holy image calm my fears, I only feel peace and confidence!" This medal is in strict agreement with the revelations received by Marie-Julie in the course of several ecstasies and recalls the special devotion that this pious stigmatist devoted to the veneration of the Cross and to the Very Holy Virgin whom she implored so often at the foot of the ancient statue of the Notre Dame de la Bonne Garde - which means Our Lady of Good Protection - and the medal has come to be known as the medal of Our Mother of Good Counsel.